As much as we love the NES, the one thing it did lack was the ability to play multiplayer games where both players were on the screen at the same time. The likes of Super Mario Bros had a two player option however this was one player at a time, where the next player plays when the first player died. Of course there were the exceptions, things like Battletoads and dare we say Anticipation (which isn’t said lightly…) which yields mixed results in terms of how good they are. Another game to add to the list is this game, which promises right on the box 4 player simultaneous action so how could you go wrong? Grab some pizzas, some beer and get your leather driving gloves on, we’re going Off Road racing! 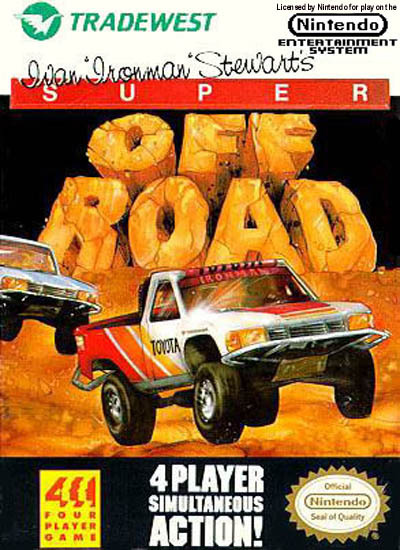 Super Off Road Racing, or Ivan ‘Ironman’ Stewart’s Super Off-Road in its entirety (but is too late to write fully) is a racing game in which you take control of what looks like a miniature off-road car and you race with three other drivers in order to win the race. Unlike R.C Pro AM where you get weapons, this is all about racing – just you, your finger on the A button and the ability to drive like Nigel Mansell. Or The Stig. There are certain similarities with R.C Pro AM such as the miniature vehicle and the ease in which you drive your car, but as we’ll see later, there are some subtle differences. 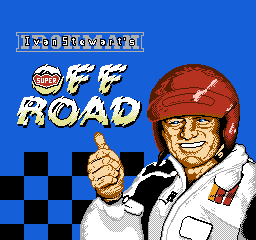 Turning on the game you get the blue-eyed red helmet wearing Ivan Stewart grinning back at you and the ability to play with up to 4 players. That is a big selling point, the fact you can have three other friends with you to race in your vehicles and see who comes out on top. 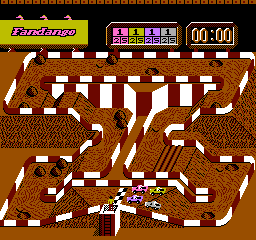 However, due to the NES console having two controller ports you do require a NES Four Score or NES Satellite in order to play with four controllers, however for some additional hardware, it’s good you can have four racers rather than 4 player Super Mario Bros where you have to wait for the first three players to die before you can take your turn. You choose your nationality though there doesn’t seem to be any difference in which nationality you pick, it’s more for nationalistic pride to which you then start racing. A good point with the game is that after each race, depending on where you finish you can customise your vehicle in terms of upgrading parts of your vehicle such as the tyres, the acceleration, the top speed – up to 6 categories. This is done by the money you win depending on where in the race you finish. It is a flat rate for each upgrade which is always good as modern games seem to increase the value of an upgrade with each upgrade you complete. It does seem sometimes that you upgrade the acceleration and top speed but in the next race the computer race past and you cannot catch them up which can be frustrating, as you may rely more on turbos which quickly run out. It’s not often that it happens, but the inconsistencies can be gruelling. Overall, although the game is similar to R.C Pro Am, there are are differences which enhance the game and make it one worthy to have in your collection. The most obvious appeal is having 4 player simultaneous action so one guy isn’t left waiting 20 minutes for the remaining three to lose their lives so that they can take their turn. The controls are simple yet responsive, and it is always intriguing to see what aspect of your vehicle gets upgraded first in order to win the matches. Although in the end if you’re that good then all parts will be upgraded fully towards the end, but especially with three other people it could make all the difference between winning and losing if one of you upgrades acceleration first for example rather than tyres. 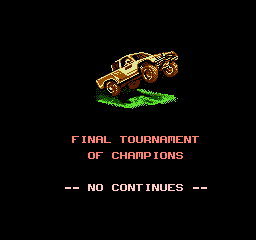 Sometimes it does feel like you go from flat out winning a race to being perilously last due to the other cars being significantly faster for no apparent reason but the only time you notice this is if you’re playing the game by yourself. The game is cheap to pick up from your local online retailers or retro game shops, so grab a horse riding helmet, spray it red, strap it on and get set for driving fun because tell me, wouldn’t you rather be placing this than Anticipation?